Malik Ghulam Habib Awan son of Malik Shah Muhammad Awan was born on August 17, 1965 in Lahore. 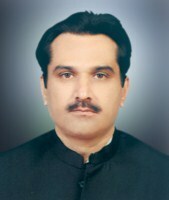 He graduated in 1986 from University of the Punjab, Lahore. He remained Member, Provincial Assembly of the Punjab from 2008-13 and 2013-18 and has returned to the Punjab Assembly for the third consecutive term in general elections 2018. House No. 39-B-I, Gulberg-III, Lahore. Village Warha Malik Shah Muhammad, Minhala Road, P/O Batapur, Lahore.